When I went to the doctors on Wednesday for my 16 week check up, my doctor informed me that I have gained 12 pounds, so far. I just couldn't believe that I gained 12 pounds. I haven't been checking the scale much at home but, the last time I checked, I was only up 3 pounds from my pre-pregnancy weight. Now, I swear I am not going to obsess over my weight gain during this pregnancy, however; I do want to stay healthy. I kind of shook it all off until I weighed myself this morning. At first, I was wondering if my scale was broken at home. When I checked this morning, I was up a total of 4.5 lbs. from my pre-pregnancy weight. After thinking about it, I figured out what must have happened. When I first got pregnant, I lost about 5 pounds in the first couple of weeks. Then, I had my doctor appointment. That's the weight they are going by. So, my scale isn't broken, and I'm not going crazy. I'm going to continue going by my scale and my pre-pregnancy weight, and I'm going to continue to weigh-in no more than once a month. I think this is a healthy approach because let's face it, gaining weight isn't easy on your mind, despite the reason. I really think that gaining 4.5 pounds in 4 months of my pregnancy is a good thing. I'm proud of that number and I want to keep gaining weight at a healthy, slow rate, such as this. The doctor told me at my appointment that a pregnant woman only really needs about 300 more calories a day for the baby. This got me motivated to get back on track with tracking my nutrition and really paying attention to the type of food I'm eating. 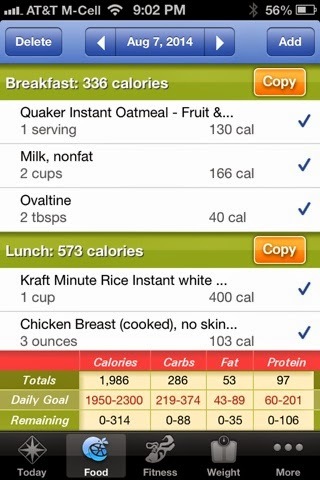 I use the Sparkpeople app to keep track of my total nutrition intakes for the day! There really was a time in the previous weeks when I couldn't do anything but eat out. I couldn't cook for myself and it's all that really sounded good. I really gave into those cravings and continued them on a little longer than they really needed to. It was an easy habit to fall into, but now that I'm feeling better most days, I should eat better, too.